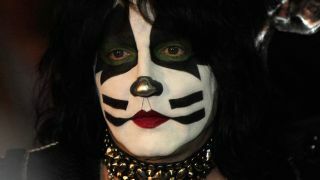 Kiss drummer Eric Singer has no interest in being part of the band without Gene Simmons and Paul Stanley. The mainman have frequently discussed the possibility of passing their onstage characters to younger replacements – and frontman Stanley said in October that the outfit would live on long after him. But Singer tells The Cassius Morris Show: “If Gene and Paul aren’t in Kiss, I don’t think I have much interest in being in Kiss. I’m not saying it’s not possible – but I doubt it will be with me. I don’t think I would want to do that. The original band lineup was inducted into the Rock And Roll Hall Of Fame this year, leading to a war of words between Simmons and Stanley and ex-members Criss and Frehley.